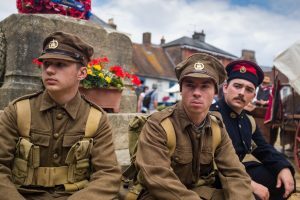 Professional and volunteer actors appeared over a hot July weekend in Wimborne town centre, dressed in First World War uniforms and each representing ten local men killed in action during the Great War. 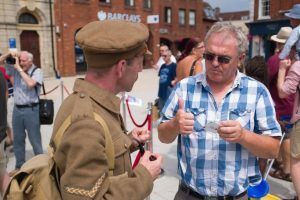 When approached as they walked about the town, the actors silently handed out a small card with personal details, researched with local historian and Town Crier, Chris Brown, about the soldiers represented. 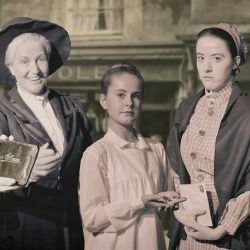 People encountered them in many different places from the town square, recreation ground, market, back alleys, supermarkets, in the Salvation Army café, and on the Minster Green. Occasionally, the soldiers seemed spontaneously to march in circles, and at other times sang a verse from a popular ‘nonsense’ song of the Great War: ‘We’re Here because we’re here because we’re here because we’re here’, followed by a loud and prolonged shout. 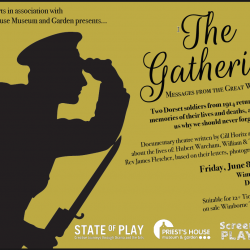 Wimborne History Festival (funded by HLF) commissioned State of Play Arts to produce Wimborne’s Silent Soldier Project which was inspired by the memorial project ‘we’re here because we’re here‘ by Jeremy Deller and Rufus Norris. Read more here. .
You can see a list of the soldiers here. . .
‘We fought for the likes of you lads and you were worth it”. 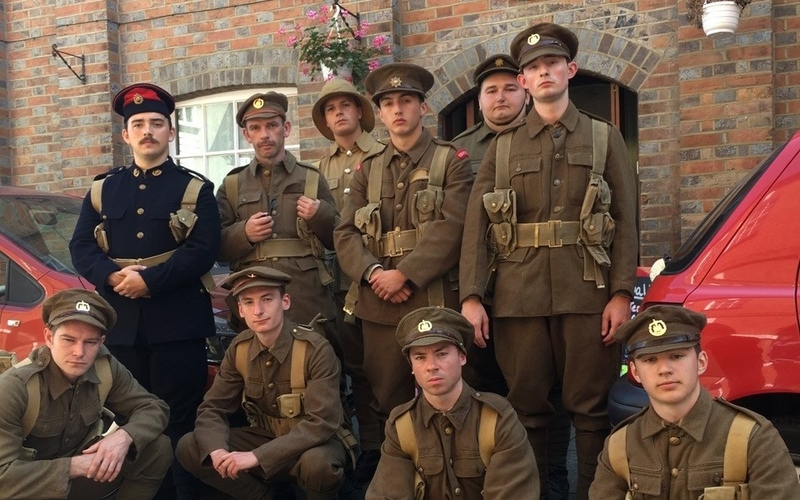 The production of the Silent Soldiers was powerful and poignant and will ensure these brave young men will not be forgotten. Silent soldiers was an amazing part of the festival. Well done on the excellent research and a BIG “shout out” to the guys who represented those who did not come home. Very poignant, really moving to see them walking around and to read their cards. 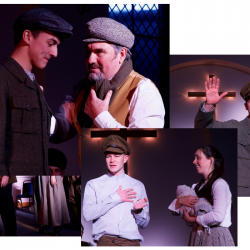 People were visibly moved by the presence of the soldiers particularly the silence of the soldiers, the singing of ‘We’re Here because we’re here…’ and the shout afterwards which they said was powerful and thought-provoking. One or two of the ‘representers’ walked over to the lads and gave out their cards. More banter followed. The silent soldiers went and did some of the marching in circles leading to the tableaux, song and shout. The lads shouted back. But then I heard some of them telling others to be more ‘respectful’. I walked over to them and discussed the concept behind the project. Surprisingly, they listened in complete silence, with full eye contact. As soon as I’d finished, they said how great they thought it was – even the dual heritage lad. 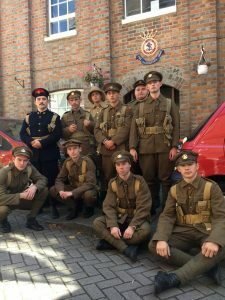 Later I discussed the encounter with the actors – some of them had been quite wound up by it – I asked them if they’d like to go back the next day and one said: “Yes, but can we take some proper guns!”! I think he was joking. The focus and commitment of the actors in preparation for the project and during the long hot weekend was exemplary. Jane Davies, former Deputy Headteacher, Poole. A very talented team and an excellent and thought-provoking presentation. I heard many comments later as to how powerful it was and how the use of drama really made the issues real. Barbara Hart, formerly Head of Service, EMTAS Team, Dorset County Council. Dorset’s excellent theatre in education team. Having worked with the team for over 12 years as a guest artist, I've witnessed the outstanding impact of their service in entertaining and dealing with educational issues in our local community. “Real wealth is only people" (Beti proverb). This company has an extraordinary, proven track record for the integrity, dedication and efficacy of its programmes for young people. They rightly enjoy an international reputation within the discourse of Theatre in Education. Their practice is internationally regarded and is a beacon for innovative and high quality theatre in education work. 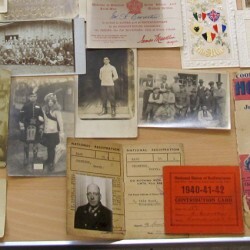 They have a very strong evidence base, and a powerful history of social intervention. As a professional Applied Theatre director and producer in Canada, I have been a long time admirer of their practice. It has an international reputation for excellent work. They offer pedagogical and epistemological alternatives to the many who 'fall through the cracks'.